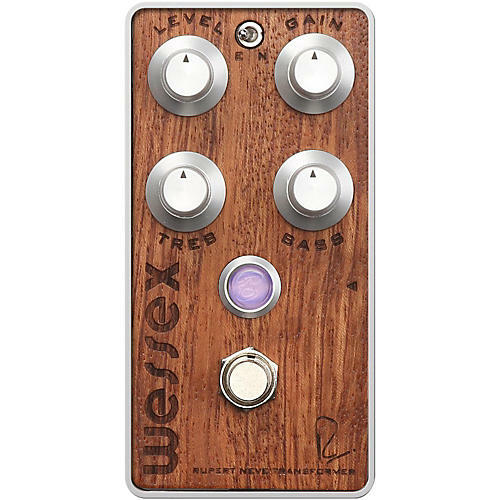 Delivering classic low gain growl to rich modern scorch, the Bogner Wessex overdrive pedal with its 100% analog circuit gets its extraordinary dimensional range from a custom transformer designed by legendary audio pioneer Mr. Rupert Neve. Whether you want to give your clean amp some muscle or juice up your vintage amp's gain, flick the tone-altering Enhance/Neutral switch to find your own dirty nirvana. Housed in an attractive bubinga chassis. Masterminds Reinhold Bogner and Mr. Rupert Neve have teamed up to produce superb audio-effects pedals that serve up rich, buttery tones, ultra-dynamic response and a stunning, three-dimensional sound quality inspired by the classic mixing consoles of the 1960's. Mr. Rupert Neve is a living legend renowned for having designed professional recording equipment and early large-format mixing consoles which feature outstanding sound thanks to his custom transformer-coupled inputs and outputs. Countless iconic rock and roll records were cut with Mr. Neve's equipment including such classics as "Rumours" by Fleetwood Mac, "Damn the Torpedoes" by Tom Petty and the Heartbreakers, and Nirvana's "Nevermind" to name just a few. Disclaimer: This Bogner pedal features an audio transformer designed by Mr. Rupert Neve of Rupert Neve Designs. The word/name Neve is a registered trademark of AMS Neve Ltd. and is in no way affiliated with this product.